A Ryanair passenger who shocked both crew and travellers when he forced his way out of the plane’s emergency exit was not just impatient to disembark—he was suffering from asthma and badly needed air, a fellow passenger told the Daily Mail. The man, a 57-year-old Polish national named Wiktor, was later arrested for the act, which saw him exit the aircraft and perch on its wing. Fellow passenger Fernando Del Valle Villalobos filmed the Jan. 1 incident and posted the footage on social media. 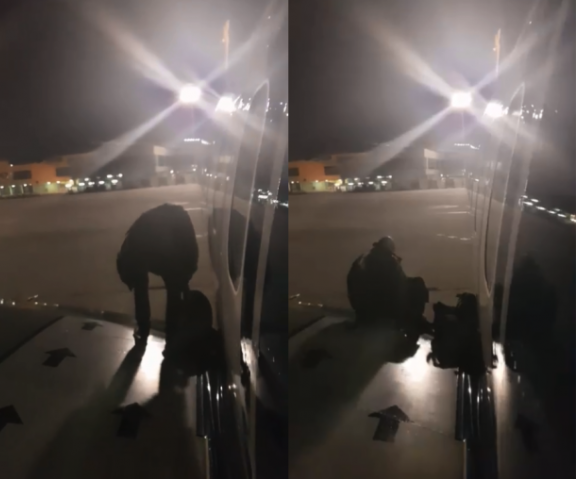 “This gentleman decided that he wasn’t going to wait any more, activate the emergency door and ready… he got out from the wing,” posted Del Valle Villalobos. Ryanair flight FR8164 from the UK to Spain faced a delay of nearly an hour leaving London’s Stansted airport on New Year’s Day, the Guardian reported. Frustration reached a tipping point for the man, reports suggest, when after arrival in Malaga passengers faced a further delay of “30 more minutes on the plane (without any explanation from Ryanair),” Del Valle Villalobos wrote. But according to the Daily Mail, fellow passenger Raj Mistry said the man had suffered an asthma attack and was having trouble breathing. “It seems nobody noticed that the man who decided to exit the plane was suffering from asthma,” Mistry said. Mistry said he spoke to the man and observed him using an inhaler a number of times on the flight. “When he used his inhaler the second time, I asked him if he is OK, he replied he’s OK, he hates flying and struggles to breathe. It is reported the man communicated his distress to security staff, but to no avail. “He needed air, hence he decided to exit the plane but Civil Guards didn’t want to listen to what he had to say,” Mistry told the Daily Mail. After sitting on the wing for some time, the man was coaxed back inside and restrained by crew members. According to the BBC, a Ryanair spokesman called the event an “airport security breach”. “Malaga airport police immediately arrested the passenger in question and since this was a breach of Spanish safety and security regulations, it is being dealt with by the Spanish authorities,” he said. The illegally egressing passenger is expected to be hit with a substantial fine of “at least four figures,” according to the Daily Mail. In August 2016, Cesar Saucedo made headlines after being filmed sprinting across a runway to catch his flight. Local reports at the time said the man could face a fine of up to $51,000, though the actual figure Saucedo was ordered to pay is unknown.